My research interests lie in the chemistry of environmental surfaces, and the transport, fate and environmental remediation of metals and organics contamination. Since arriving at the University of Alberta in 2013 as the inaugural Encana Chair in Water Resources, I have established a research group that studies the water cycle in unconventional energy recovery and environmental geochemistry. Along with conducting research and mentoring the undergraduate and graduate students of my lab, I teach courses at the University of Alberta including Planet Earth, Environment Alberta, Environmental Geochemistry, and Contaminant Hydrogeology, and serve on the editorial boards of five professional journals. Currently, in collaboration with E3 Metals Corp, I am exploring different technologies to extract lithium, a commodity in high demand in a clean energy economy, from petrobrines located in Alberta. The low molar ratio of lithium to other ions, such as calcium and magnesium, makes its recovery uniquely challenging, which necessitates a concentration step followed by purification. Conventionally, lithium has been concentrated in evaporation ponds and precipitated as lithium carbonate. Such an environmentally intrusive approach is not feasible in the cold climate of Alberta; therefore, we are investigating less tapped technologies to selectively extract lithium from the petrobrines. I define myself as an environmental engineer. My research interests focus on soil and water remediation both at a mechanistic level and a practical level. In Alessi's group, I will investigate the surface chemistry between contaminated compounds and biochar/sediments using both laboratory experiments and complexation modeling. I will also investigate the characteristics of the fate of the contaminants in hydraulic fracturing water, as well as hydraulic fracturing relatedwater and surface chemistry. Before joining Alessi's group, I obtained my PhD degree in Civil and Environmental Engineering at the University of Cambridge (UK) and Master's and Bachelor's degrees in Geological Engineering at Nanjing University (China). My postdoctoral position is funded by the Killam Trust (Killam Postdoctoral Fellow). My primary research interest is chemical analysis of flowback water for characterization of the induced fracture network by hydraulic fracturing operations. I am particularly focused on the thermodynamic interactions between shale and water under reservoir conditions. I also study the fate of fracturing fluid, and the environmental impacts of the produced wastewater from hydraulic fracturing operations. My other expertise includes membrane fabrication, nano-/micro-filtration, gas separation using membrane contactors, and solar still design. I am interested in understanding the fate and transport of contaminants in groundwater through laboratory experimentation and mathematical (analytical and numerical) modeling. My research focuses on two projects: 1) Laboratory-based experiments aimed at determining the sorption behavior of novel contaminants found in flowback and produced waters from hydraulic fracturing operations in Alberta, and 2) The development of new mathematical techniques for modeling the fate and transport of contaminants in groundwater. Each project is motivated to improve risk management and the remediation of flowback and produced waters spills in Alberta. I investigate the mobility and environmental impact of heavy metals in an abandoned and partially remediated uranium mine in northern Saskatchewan. The goal is to obtain a big picture about where the metals are located in the lake and sediment, where they are being transported, and prediction of what risks could come from this site in the future. In addition to this project, I am also interested in the use of biochar for greenhouse gas mitigation, water purification, and soil improvements, and investigate the microbiology of ring shaped natural features in the Canadian boreal forest. I am focused on using metagenomics to track the dynamics of microbial communities by applying 16S rRNA gene sequencing and cell staining on water samples from fractured shale gas wells in Alberta. A better understanding of microbial community dynamics and how they are influe nced by hydraulic fracturing, from surface fracturing preparation to in the deep subsurface, may help to make the water cycle more efficient, which ultimately contributes to reducing environmental stress and achieving overall economic benefit. I am interested in understanding the characteristics of nanoparticles released from biochar (BCNPs) and their impact on our aqueous environment. My research focuses on investigating the interaction mechanisms of BCNPs between metals and organic species in aqueous system, which includes research on the surface chemistry and photochemistry of BCNPs. This project contributes to a better understanding of the effect of the application of biochar on our environment. My research focuses on characterizing poorly-crystalline siderite, particularly its solubility and its capability to both sorb and reduce chromium(VI). Through the use of an anaerobic chamber, the goal of my research is to: (1) Determine the solubility product of poorly-crystalline siderite, (2) Explore the capacity of poorly-crystalline siderite to reduce Cr(VI) to Cr(III), and (3) Characterize the morphology and structure of the solid Cr(III) products formed following metal reduction. Reductive immobilization by siderite may be an effective remediation technique for the removal of Cr(VI) from groundwater. I am an environmental geochemistry student focusing on low-temperature aqueous geochemistry in surface and groundwater. Currently I am conducting a baseline study of the chemistry of numerous lakes within Parkland County, Alberta. I am employing the use of Piper diagrams and activity plots to evaluate water quality due to agricultural and residential pollution and assess potential causes for recent lake level declines within the region. I am an environmental engineering graduate, and I am currently researching methods to selectively extract lithium from underground brine reservoirs and from fracking flowback water in Alberta. My main research topic focuses on studying the effects of temperature, pH, and various other parameters in order to optimize experimental conditions to extract lithium. The main goal of the project is to create a lithium extraction process which would be economically viable on a commercial scale. Isabel was a MSc student in the Alessi group from January 2017 to December 2018. She analyzed the effects of aeration-oxidation as a pre-treatment mechanism for flowback and produced water (FPW) generated from hydraulic fracturing in Alberta, Canada to provide insights into the processes of solids separation during microfiltration and ultimately aid in the reuse and recycling of FPW. David was a research assistant and then a MSc student in the Alessi group from December 2015 to September 2018. He built a high-level, comprehensive hydrogeological model of the Fox Creek area in Alberta to understand the interplay between groundwater and surface water. After graduating, he joined Matrix Solutions in Edmonton, Alberta as a hydrogeologist. Samrat was a PhD student in the Alessi group from September 2013 to June 2018. He focused on developing mechanistic models of heavy metals immobilization on biochar using surface complexation modeling, and characterization techniques including synchrotron studies and isothermal titration calorimetry. Following graduation, he joined the group of Dr. Maria Dittrich as a Roger E. Deane Postdoctoral Fellow. Manuel was an undergraduate research assistant and then a MSc student in the Alessi group from May 2014 to September 2017. 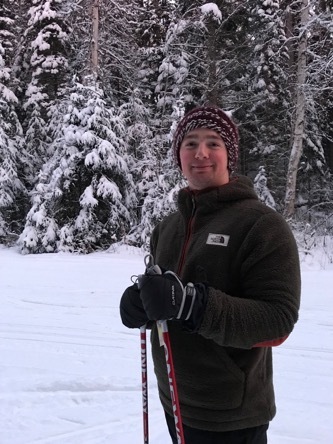 He studied the reductive immobilization of chromium by biochar, and following graduation joined Golder Associates in Calgary, Alberta as a Junior Geochemist. Shannon was a postdoctoral researcher in the Alessi group from November 2014 to August 2017. He studied the geochemistry of the hydraulic fracturing water cycle before taking a position as Lecturer in Inorganic Geochemistry at Newcastle University, UK. We are always looking for motivated and qualified graduate students to join our research group! A great fit is a self-motivated student who is curious to learn about the mechanisms driving chemical cycling in the environment and eager to apply the science to real-world applications. Our research group is collaborative, supportive, and simply fun. Edmonton is a wonderful city, boasting one of the largest city parks in North America. The Canadian Rockies, with Banff and Jasper National Parks, are just a short 4-hour drive away. If you're interested in attending graduate school at University of Alberta, please send Dr. Alessi an email with a copy of your CV and a statement of why you're interested in working in the Alessi Lab. Our graduate student applicant pool is competitive, and I'm particularly interested in taking students that have ideas of what they'd like to work on and why we'd be a good fit. Students have the option of pursuing thesis based research at the MSc or PhD level through the Department of Earth and Atmospheric Sciences. For detailed application procedures, visit our Graduate Studies page. While we have a strong funding base, highly competitive scholarship funding is available to both Canadian or International applicants. Students with strong undergraduate academic records are encouraged to apply for Provincial or Federal (NSERC) studentships. Students with >3.9 GPA have a high likelihood of being nominated for a Vanier Scholarship, currently valued at $50,000 Canadian. To discuss potential funding opportunities, contact Dr. Alessi.